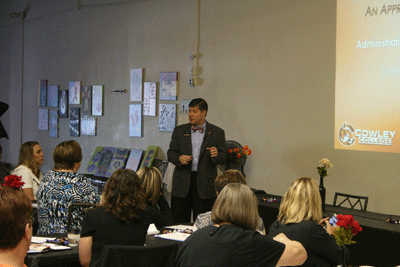 Cowley College president Dr. Dennis Rittle was a special guest at the Arkansas City Administrative Assistants of Kansas Cities (AAKC) meeting held Friday. Dr. Rittle’s topic of discussion was Team Building: An Approach in Spelunky. He also discussed the difference between a group and a team, what is the value of a team, and provided individuals with an activity called “Cave without a Name”. Dr. Rittle had individuals read the background of the story and then form into teams of three members to respond to questions. The groups discussed the dynamics and synergy of the story. Lory West, Cowley College BCIT faculty, then spoke to the group about Interactive Professional Development, while Graves Drug in Arkansas City provided lunch. The Administrative Assistants of Kansas Cities (AAKC) focuses on professionalism and training for professional growth. The members of the organization have used their talents to advance and enhance their knowledge of the profession.